The sign of a truly great scientific theory is by the outcomes it predicts when you run experiments or perform observations. And one of the greatest theories ever proposed was the concept of Relativity, described by Albert Einstein in the beginning of the 20th century. In addition to helping us understand that light is the ultimate speed limit of the Universe, Einstein described gravity itself as a warping of spacetime. He did more than just provide a bunch of elaborate new explanations for the Universe, he proposed a series of tests that could be done to find out if his theories were correct. One test, for example, completely explained why Mercury’s orbit didn’t match the predictions made by Newton. Other predictions could be tested with the scientific instruments of the day, like measuring time dilation with fast moving clocks. Since gravity is actually a distortion of spacetime, Einstein predicted that massive objects moving through spacetime should generate ripples, like waves moving through the ocean. Just by walking around, you leave a wake of gravitational waves that compress and expand space around you. However, these waves are incredibly tiny. Only the most energetic events in the entire Universe can produce waves we can detect. It took over 100 years to finally be proven true, the direct detection of gravitational waves. In February, 2016, physicists with the Laser Interferometer Gravitational Wave Observatory, or LIGO announced the collision of two massive black holes more than a billion light-years away. Any size of black hole can collide. Plain old stellar mass black holes or supermassive black holes. Same process, just on a completely different scale. Let’s start with the stellar mass black holes. These, of course, form when a star with many times the mass of our Sun dies in a supernova. Just like regular stars, these massive stars can be in binary systems. Imagine a stellar nebula where a pair of binary stars form. But unlike the Sun, each of these are monsters with many times the mass of the Sun, putting out thousands of times as much energy. The two stars will orbit one another for just a few million years, and then one will detonate as a supernova. Now you’ll have a massive star orbiting a black hole. And then the second star explodes, and now you have two black holes orbiting around each other. As the black holes zip around one another, they radiate gravitational waves which causes their orbit to decay. This is kind of mind-bending, actually. The black holes convert their momentum into gravitational waves. As their angular momentum decreases, they spiral inward until they actually collide. What should be one of the most energetic explosions in the known Universe is completely dark and silent, because nothing can escape a black hole. No radiation, no light, no particles, no screams, nothing. And if you mash two black holes together, you just get a more massive black hole. The gravitational waves ripple out from this momentous collision like waves through the ocean, and it’s detectable across more than a billion light-years. This is exactly what happened earlier this year with the announcement from LIGO. This sensitive instrument detected the gravitational waves generated when two black holes with 30 solar masses collided about 1.3 billion light-years away. This wasn’t a one-time event either, they detected another collision with two other stellar mass black holes. Regular stellar mass black holes aren’t the only ones that can collide. Supermassive black holes can collide too. From what we can tell, there’s a supermassive black hole at the heart of pretty much every galaxy in the Universe. The one in the Milky Way is more than 4.1 million times the mass of the Sun, and the one at the heart of Andromeda is thought to be 110 to 230 million times the mass of the Sun. In a few billion years, the Milky Way and Andromeda are going to collide, and begin the process of merging together. Unless the Milky Way’s black hole gets kicked off into deep space, the two black holes are going to end up orbiting one another. Just with the stellar mass black holes, they’re going to radiate away angular momentum in the form of gravitational waves, and spiral closer and closer together. Some point, in the distant future, the two black holes will merge into an even more supermassive black hole. The Milky Way and Andromeda will merge into Milkdromeda, and over the future billions of years, will continue to gather up new galaxies, extract their black holes and mashing them into the collective. Black holes can absolutely collide. Einstein predicted the gravitational waves this would generate, and now LIGO has observed them for the first time. As better tools are developed, we should learn more and more about these extreme events. In a previous article, I talked about how you can generate artificial gravity by accelerating at 9.8 meters per second squared. Do that and you pretty much hit the speed of light, then you decelerate at 1G and you’ve completed an epic journey while enjoying comfortable gravity on board at the same time. It’s a total win win. What I didn’t mention how this acceleration messes up time for you and people who aren’t traveling with you. Here’s the good news. If you accelerate at that pace for years, you can travel across billions of light years within a human lifetime. Here’s the bad news, while you might experience a few decades of travel, the rest of the Universe will experience billions of years. The Sun you left will have died out billions of years ago when you arrive at your destination. Welcome to the mind bending implications of constantly accelerating relativistic spaceflight. The effect of time dilation is negligible for common speeds, such as that of a car or even a jet plane, but it increases dramatically when one gets close to the speed of light. It works like this. The speed of light is always constant, no matter how fast you’re going. If I’m standing still and shine a flashlight, I see light speed away from me at 300,000 km/s. And if you’re traveling at 99% the speed of light and shine a flashlight, you’ll see light moving away at 300,000 km/s. But from my perspective, standing still, you look as if you’re moving incredibly slowly. And from your nearly light-speed perspective, I also appear to be moving incredibly slowly – it’s all relative. Whatever it takes to make sure that light is always moving at, well, the speed of light. This is time dilation, and you’re actually experiencing it all the time, when you drive in cars or fly in an airplane. The amount of time that elapses for you is different for other people depending on your velocity. That amount is so minute that you’ll never notice it, but if you’re traveling at close to the speed of light, the differences add up pretty quickly. But it gets even more interesting than this. If you could somehow build a rocket capable of accelerating at 9.8 meters/second squared, and just went faster and faster, you’d hit the speed of light in about a year or so, but from your perspective, you could just keep on accelerating. And the longer you accelerate, the further you get, and the more time that the rest of the Universe experiences. The really strange consequence, though, is that from your perspective, thanks to relativity, flight times are compressed. I’m using the relativistic star ship calculator at convertalot.com. You should give it a try too. For starters, let’s fly to the nearest star, 4.3 light-years away. I accelerate halfway at a nice comfortable 1G, then turn around and decelerate at 1G. It only felt like 3.5 years for me, but back on Earth, everyone experienced almost 6 years. At the fastest point, I was going about 95% the speed of light. Let’s scale this up and travel to the center of the Milky Way, located about 28,000 light-years away. From my perspective, only 20 years have passed by. But back on Earth, 28,000 years have gone by. At the fastest point, I was going 99.9999998 the speed of light. Let’s go further, how about to the Andromeda Galaxy, located 2.5 million light-years away. The trip only takes me 33 years to accelerate and decelerate, while Earth experienced 2.5 million years. See how this works? I promised I’d blow your mind, and here it is. If you wanted to travel at a constant 1G acceleration and then deceleration to the very edge of the observable Universe. That’s a distance of 13.8 billion light-years away; you would only experience a total of 45 years. Of course, once you got there, you’d have a very different observable Universe, and billions of years of expansion and dark energy would have pushed the galaxies much further away from you. Some galaxies will have fallen over the cosmic horizon, where no amount of time would ever let you reach them. If you wanted to travel 100 trillion light years away, you could make the journey in 62 years. By the time you arrived, the Universe would be vastly different. Most of the stars would have died a long time ago, the Universe would be out of usable hydrogen. You would have have left a living thriving Universe trillions of years in the past. And you could never get back. Our good friends over at Kurzgesagt covered a very similar topic, discussing the limits of humanity’s exploration of the Universe. It’s wonderful and you should watch it right now. Of course, creating a spacecraft capable of constant 1G acceleration requires energies we can’t even imagine, and will probably never acquire. And even if you did it, the Universe you enjoy would be a distant memory. So don’t get too excited about fast forwarding yourself trillions of years into the future. At the turn of the 20th Century, Einstein’s theory of relativity stunned the physics world, but the experimental evidence needed to be found. And so, in 1919, another respected astronomer, Arthur Eddington, observed the deflection of stars by the gravity of the Sun during a solar eclipse. Here’s the story of that famous experiment. One of the most amazing implications of Einstein’s relativity is the fact that the inertial mass of an object depends on its velocity. That sounds like a difficult thing to test, but that’s exactly what happened through a series of experiments performed by Kaufmann, Bucherer, Neumann and others. We’ve come a long way in 13.8 billion years; but despite our impressively extensive understanding of the Universe, there are still a few strings left untied. For one, there is the oft-cited disconnect between general relativity, the physics of the very large, and quantum mechanics, the physics of the very small. Then there is problematic fate of a particle’s intrinsic information after it falls into a black hole. Now, a new interpretation of fundamental physics attempts to solve both of these conundrums by making a daring claim: at certain scales, space and time simply do not exist. Let’s start with something that is not in question. Thanks to Einstein’s theory of special relativity, we can all agree that the speed of light is constant for all observers. We can also agree that, if you’re not a photon, approaching light speed comes with some pretty funky rules – namely, anyone watching you will see your length compress and your watch slow down. But the slowing of time also occurs near gravitationally potent objects, which are described by general relativity. So if you happen to be sight-seeing in the center of the Milky Way and you make the regrettable decision to get too close to our supermassive black hole’s event horizon (more sinisterly known as its point-of-no-return), anyone observing you will also see your watch slow down. In fact, he or she will witness your motion toward the event horizon slow dramatically over an infinite amount of time; that is, from your now-traumatized friend’s perspective, you never actually cross the event horizon. You, however, will feel no difference in the progression of time as you fall past this invisible barrier, soon to be spaghettified by the black hole’s immense gravity. And there is an additional, bigger problem. 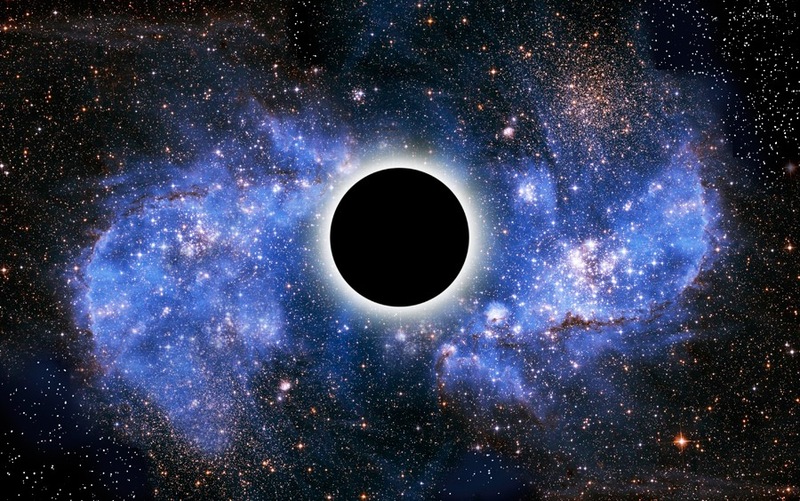 A black hole’s event horizon is thought to give rise to Hawking radiation, a kind of escaping energy that will eventually lead to both the evaporation of the black hole and the destruction of all of the matter and energy that was once held inside of it. This concept has black hole physicists scratching their heads. Because according to the laws of physics, all of the intrinsic information about a particle or system (namely, the quantum wavefunction) must be conserved. It cannot just disappear. Why all of these bizarre paradoxes? Because black holes exist in the nebulous space where a singularity meets general relativity – fertile, yet untapped ground for the elusive theory of everything. Enter two interesting, yet controversial concepts: doubly special relativity and gravity’s rainbow. Just as the speed of light is a universally agreed-upon constant in special relativity, so is the Planck energy in doubly special relativity (DSR). In DSR, this value (1.22 x 1019 GeV) is the maximum energy (and thus, the maximum mass) that a particle can have in our Universe. Two important consequences of DSR’s maximum energy value are minimum units of time and space. That is, regardless of whether you are moving or stationary, in empty space or near a black hole, you will agree that classical space breaks down at distances shorter than the Planck length (1.6 x 10-35 m) and classical time breaks down at moments briefer than the Planck time (5.4 x 10-44 sec). In other words, spacetime is discrete. It exists in indivisible (albeit vanishingly small) units. Quantum below, classical above. Add general relativity into the picture, and you get the theory of gravity’s rainbow. Physicists Ahmed Farag Ali, Mir Faizal, and Barun Majumder believe that these theories can be used to explain away the aforementioned black hole conundrums – both your controversial spaghettification and the information paradox. How? According to DSR and gravity’s rainbow, in regions smaller than 1.6 x 10-35 m and at times shorter than 5.4 x 10-44 sec… the Universe as we know it simply does not exist. The event horizon of a black hole, however, is a different story. After all, the event horizon isn’t made of particles. It is pure spacetime. And according to Ali and his colleagues, if you could observe it on extremely short time or distance scales, it would cease to have meaning. It wouldn’t be a point-of-no-return at all. In their view, the paradox only arises when you treat spacetime as continuous – without minimum units of length and time. “As the information paradox depends on the existence of the event horizon, and an event horizon like all objects does not exist below a certain length and time interval, then there is no absolute information paradox in gravity’s rainbow. 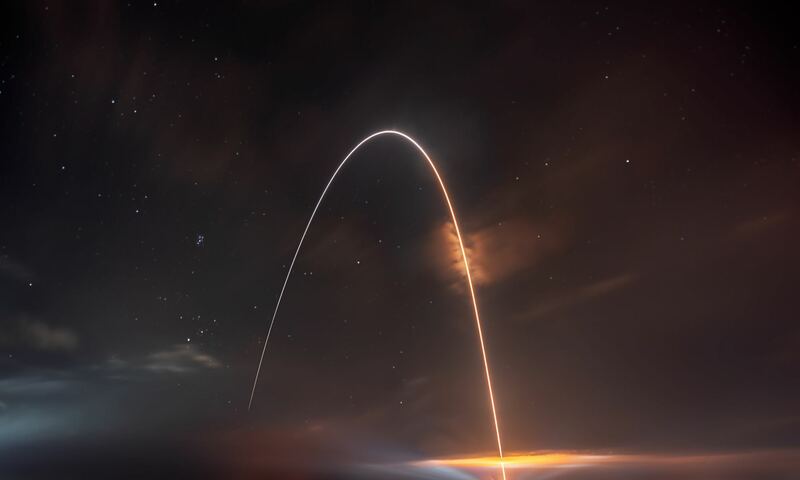 The absence of an effective horizon means that there is nothing absolutely stopping information from going out of the black hole,” concluded Ali. No absolute event horizon, no information paradox. And what of your spaghettification within the black hole? Again, it depends on the scale at which you choose to analyze your situation. In gravity’s rainbow, spacetime is discrete; therefore, the mathematics reveal that both you (the doomed in-faller) and your observer will witness your demise within a finite length of time. But in the current formulation of general relativity, where spacetime is described as continuous, the paradox arises. The in-faller, well, falls in; meanwhile, the observer never sees the in-faller pass the event horizon. To recap: if spacetime continues on arbitrarily small scales, the paradoxes remain. If, however, gravity’s rainbow is correct and the Planck length and the Planck time are the smallest unit of space and time that fundamentally exist, we’re in the clear… at least, mathematically speaking. Unfortunately, the Planck scales are far too tiny for our measly modern particle colliders to probe. So, at least for now, this work provides yet another purely theoretical result. The paper was published in the January 23 issue of Europhysics Letters. A pre-print of the paper is available here. Gravity’s a funny thing. Not only does it tug away at you, me, planets, moons and stars, but it can even bend light itself. And once you’re bending light, well, you’ve got yourself a telescope. Everyone here is familiar with the practical applications of gravity. If not just from exposure to Loony Tunes, with an abundance of scenes with an anthropomorphized coyote being hurled at the ground from gravitational acceleration, giant rocks plummeting to a spot inevitably marked with an X, previously occupied by a member of the “accelerati incredibilus” family and soon to be a big squish mark containing the bodily remains of the previously mentioned Wile E. Coyote. Despite having a very limited understanding of it, Gravity is a pretty amazing force, not just for decimating a infinitely resurrecting coyote, but for keeping our feet on the ground and our planet in just the right spot around our Sun. The force due to gravity has got a whole bag of tricks, and reaches across Universal distances. But one of its best tricks is how it acts like a lens, magnifying distant objects for astronomy. Thanks to the general theory of relativity, we know that mass curves the space around it. The theory also predicted gravitational lensing, a side effect of light travelling along the curvature of space and time where light passing nearby a massive object is deflected slightly toward the mass. It was first observed by Arthur Eddington and Frank Watson Dyson in 1919 during a solar eclipse. The stars close to the Sun appeared slightly out of position, showing that the light from the stars was bent, and demonstrated the effect predicted. This means the light from a distant object, such as a quasar, could be deflected around a closer object such as a galaxy. This can focus the quasar’s light in our direction, making it appear brighter and larger. So gravitational lensing acts as a kind of magnifying glass for distant objects making them easier to observe. We can use the effect to peer deeper into the Universe than would otherwise be possible with our conventional telescopes. In fact, the most distant galaxies ever observed, ones seen just a few hundred million years after the Big Bang, were all discovered using gravitational lensing. Astronomers use gravitational microlensing to detect planets around other stars. The foreground star acts as a lens for a background star. As the star brightens up, you can detect further distortions which indicate there are planets. Even amateur telescopes are sensitive enough to spot them, and amateurs regularly help discover new planets. Unfortunately, these are one time events as this alignment happens only once. There’s a special situation known as an Einstein Ring, where a more distant galaxy is warped by a nearby galaxy into a complete circle. To date a few partial rings have been seen, but no perfect Einstein Ring has ever been spotted. Gravitational lensing also allows us to observe invisible things in our Universe. Dark matter doesn’t emit or absorb light on its own, so we can’t observe it directly. We can’t take a photo and say “Hey look, dark matter!”. However, it does have mass, and that means it can gravitationally lens light originating behind it. So we’ve even used the effect of gravitational lensing to map out dark matter in the Universe. What about you? Where should we focus our gravitational lensing efforts to get a better look in the Universe? Tell us in the comments below. How are Energy and Matter the Same? As Einstein showed us, light and matter and just aspects of the same thing. Matter is just frozen light. And light is matter on the move. How does one become the other? Albert Einstein’s most famous equation says that energy and matter are two sides of the same coin. But what does that really mean? And how are equations famous? I like to believe equations can be famous in the way a work of art, or a philosophy can be famous. People can have awareness of the thing, and yet never have interacted with it. They can understand that it is important, and yet not understand why it’s so significant. Which is a little too bad, as this is really a lovely mind bending idea. The origin of E=mc2 lies in special relativity. Light has the same speed no matter what frame of reference you are in. No matter where you are, or how fast you’re going. If you were standing still at the side of the road, and observed a car traveling at ¾ light speed, you would see the light from their headlights traveling away from them at ¼ the speed of light. But the driver of the car would still see that the light moving ahead of them at the speed of light. This is only possible if their time appears to slow down relative to you, and you and the people in the car can no longer agree on how long a second would take to pass. 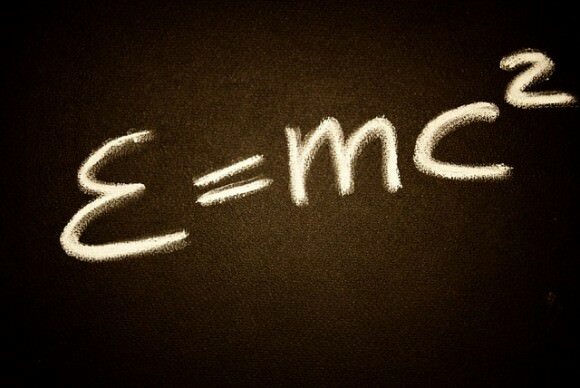 Einstein’s famous equation. Image via Pixabay. So the light appears to be moving away from them more slowly, but as they experience things more slowly it all evens out. This also affects their apparent mass. If they step on the gas, they will speed up more slowly than you would expect. It’s as if the car has more mass than you expect. So relativity requires that the faster an object moves, the more mass it appears to have. This means that somehow part of the energy of the car’s motion appears to transform into mass. Hence the origin of Einstein’s equation. How does that happen? We don’t really know. We only know that it does. The same effect occurs with quantum particles, and not just with light. A neutron, for example, can decay into a proton, electron and anti-neutrino. The mass of these three particles is less than the mass of a neutron, so they each get some energy as well. So energy and matter are really the same thing. Completely interchangeable. And finally, Although energy and mass are related through special relativity, mass and space are related through general relativity. You can define any mass by a distance known as its Schwarzschild radius, which is the radius of a black hole of that mass. So in a way, energy, matter, space and time are all aspects of the same thing. What do you think? Like E=mc2, what’s the most famous idea you can think of in physics? Flavor Flav knows what time it is. At least he does for Flavor Flav. Even with all his moving and accelerating, with the planet, the solar system, getting on planes, taking elevators, and perhaps even some light jogging. In the immortal words of Kool Moe Dee. Do you know what time it is? Didn’t Einstein tell us it’s all relative? Does anyone actually know what time it is? I mean, aside from figuratively, or in a political sense, or perhaps as part of rap performance from whence the power is being fought from, requiring the sick skills of a hype man wearing a clock around his neck on a big chain. So, after all my fancy dancing and longing for a time in rap and hip hop from days gone by, I must present to you “faithful audience member” an answer in the form of your 3 least favorite words I get to deliver. You have heard that everything is relative, usually we hear it from people who like to talk about “connections on many different levels”, which is just nonsense. But in physics “everything” is relative in a very particular way. Everything is relative to the speed of light, which is the same in every reference frame. Which is confusing and repeated enough that it can become meaningless. So I’m going to do my best to explain it. If I shine a flashlight in front of me, I will measure the beam to travel at about 300,000 km/s, which is also known as the speed of light. And if you are moving at 200,000 km/s faster than me, and shine a flashlight ahead of you, I will see the light from your flashlight moving at the 300,000km/s. It will appear to me, as though the light from your flashlight is moving away from you at 100,000 km/s. But when you will measure the speed of that light, relative to you, you’d think it’d be moving at 100,000 km/s as well, but instead from your perspective it will ALSO clock in at 300,000 km/s. Artist’s impression – General Relativity. The speed of light. How is this even possible? It is possible in part because the rate at which you experience time relative to me changes. For you, time will seem normal, but from my perspective your time will seem slower. We agree on how fast light is moving in kilometers per second, but we disagree how long a second is. We also, by the way, disagree on the length of a meter. This seems strange because we imagine that space and time are absolute things, and light is something that travels through space. This is our experience. Suggesting things like time and space are malleable values at best is unsettling and at worst will make us nanners from thinking too much about. Hold on to your tinfoil hats, for it is in fact light that is the absolute, and space and time are relative to it. So what time it is depends upon your vantage point, and so there is no single absolute time. Finally, because of relativity, each point in the Universe experiences time at a slightly different rate. For example, when we observe the cosmic microwave background, we find that we are moving at a speed of about 630 km/s relative to the background. That means we experience time a bit more slowly that something at rest relative to the cosmic background. It’s just a tiny bit slower, but added over the entire age of the Universe, our cosmic clock is 30,000 years behind the times. Feel free to set your watch. But don’t get too precise about it. Your time could be off by tens of thousands of years. What about you? What’s your favorite way to explain special relativity to someone. Tell us in the comments below.